Drexel law professor Adam Benforado argues that the root causes of many criminal justice failures lie in misunderstandings of human psychology and behavior. Recent events have spotlighted multiple failures in the American criminal justice system. In North Charleston, South Carolina, Walter Scott is shot and killed while running away from a policeman, who then plants a stun gun by Scott’s body to provide a motive for the shooting. In Cleveland, 12-year-old Tamir Rice was shot and killed while playing with a toy gun, and his 14-year-old sister is handcuffed and threatened with arrest after she ran to her brother’s aid. In Baltimore, Freddie Gray dies while in police custody, and it becomes clear that his “rough ride” in a police wagon (the apparent cause of his fatal spinal injury) was not an aberration but an unofficial but regularly-used police procedure. These incidents are just a few among the many that have drawn attention to problematic aspects of how the criminal justice system operates in the United States. Theoretically, we are all equal before the law, police serve the communities in which they work, and preservation of human life is among the highest priorities of the system. The reality is often quite different—for instance, in the incidents named above, all the victims were black, and black Americans have disproportionate numbers of police encounters, arrests, and convictions, as well as a much higher probability of being shot by a policeman. There's no lack of evidence to underline the fact that, although Lady Justice may be blind, the actual criminal justice system is anything but. While it may be convenient to attribute this problem to individual failings such as racial prejudice or corruption, Adam Benforado, a law professor at Drexel University, believes the problem has a systemic basis. Two related facts are key to his explanation: first, that the people who operate the criminal justice system have all the shortcomings and failings of people in general, and second, that the criminal justice system is based on misunderstandings about how people think and act. Together, in Benforado’s view, these two facts can explain the kind of inequalities and injustices seen on a regular basis, without the need for any individual actor to be evil, corrupt, or prejudiced. 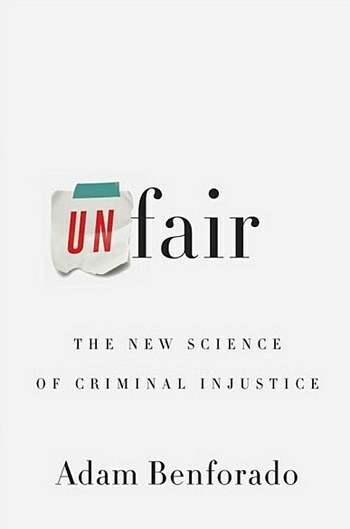 Benforado makes a compelling case, backed with reference to extensive scientific research, for this point of view in Unfair: The New Science of Criminal Injustice. While much of what he has to say is not new (Elizabeth Loftus has been publishing on the unreliability of eyewitness testimony since the '70s), it's not common knowledge for the general public, or, apparently, for many who work in the criminal justice system. Unfair presents its arguments in four main categories, the first three of which represent stages in the criminal justice system: Investigation, Adjudication, and Punishment. The fourth, Reform, offers suggestions of how the American system might be modified to take into account current knowledge about psychology, and discusses alternative practices that have been successful in other countries. Benforado introduces his key points with stories of particular cases intended to make the reader question his or her own assumptions, a useful technique that also makes this book more appealing to a general audience. Over and over again, Benforado demonstrates that basic assumptions underlying the criminal justice system are not supported by scientific evidence. For example, we tend to believe that we can tell when someone is lying, a power we also attribute to jury members and policemen but, as Benforado shows, this assumption is sadly mistaken. We also assume that only a guilty person would confess to a crime, but Benforado shows that the Reid Technique of Interviewing and Interrogation, commonly taught to police officers, can actually encourage false confessions. The adversarial system is meant to produce justice, but may in fact encourage dishonesty and an exclusive focus on winning, as if a football match rather than a person’s fate were at stake. Eyewitnesses to a crime are often treated as the gold standard of evidence, but they are often wrong, in systematic and predictable ways. Even video evidence is subject to interpretation, and factors such as the direction the camera is pointing can play a crucial role in how people view the events recorded. Benforado also reminds us how far the practice of criminal justice has drifted from its ostensible goals. The legal system is meant to dispense justice, not revenge or retribution. Police officers are supposed to keep communities safe, not terrorize their members. The penal system is intended to rehabilitate prisoners and restore them to society, not merely to lock them away and punish them. He is hopeful, however, that the system can be reformed, and the information in this book is offered in part toward that end. Unfair offers an excellent overview of an important body of information. My one quibble is with the presentation of the sources cited in the main text. There are no in-text references or endnotes, only an alphabetical list of sources for each chapter, making it more difficult than necessary to locate the studies supporting a particular point. Benforado states that, in the interests of creating a more readable text (and saving money by keeping the page count lower), he chose not to include endnotes in the book, but that detailed endnotes are available online. This is a disappointing decision—why should we have to depend on something as ephemeral as the Internet for what should be a basic part of a book?—and ignores an obvious solution, which is to list the sources in order by page number, with a brief textual lead-in for each. Many nonfiction books written for a general audience use this system, and in fact Benforado uses it in the online notes; the failure to include this information in the printed book is a misstep out of keeping with the otherwise high quality of this book.